Lawrence Talbot's childhood ended the night his mother died. After he left the sleepy Victorian hamlet of Blackmoor, he spent decades recovering and trying to forget. But when his brother's fiancée tracks him down to help find her missing love, Talbot returns home to join the search. He learns that something with brute strength and insatiable bloodlust has been killing the villagers, and that a suspicious Scotland Yard inspector has come to investigate. Fun version and the narrator does an excellent job. 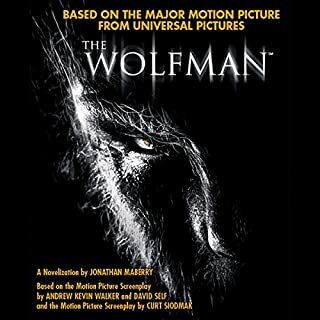 If you saw the movie with Benecio del Toro you'll still really enjoy as you get all the details of changing into and being a werewolf. New Mexico Territory, 1875. A stranger with no memory of his past stumbles into the hard desert town of Absolution. The only hint to his history is a mysterious shackle that encircles one wrist. What he discovers is that the people of Absolution don’t welcome strangers, and nobody makes a move on its streets unless ordered to do so by the iron-fisted Colonel Dolarhyde. It’s a town that lives in fear. But Absolution is about to experience fear it can scarcely comprehend. I enjoyed the movie so seeing the characters with those actors in mind really made this book fun. 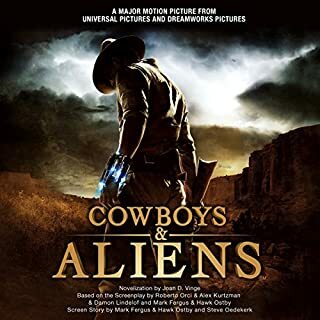 But even if you didn't see the movie you'll love this exciting tale of Cowboys & Aliens made totally plausible by the author! Enjoy!! !